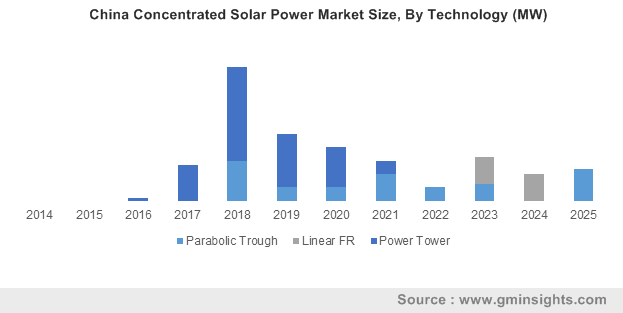 Concentrated Solar Power Market size was valued over USD 8 billion in 2018 and annual installed capacity is set to exceed 800 MW by 2025. Stringent environmental regulations and ongoing government initiatives toward promotion of renewable energy favored by carbon emission reduction targets will drive the Concentrated Solar Power market. For instance, according to the UN in December 2017, China has achieved its 2020 carbon reduction targets three years ahead of schedule. However, the industry may witness subdued growth on account of cheaper renewable alternatives including solar photovoltaic (PV), which pose significant threat across the business landscape. CSP market will witness growth on account of appreciable decline in overall project capital expenditure primarily characterized by growing competition fueled by reverse bidding processes. As per a study by International Renewable Energy Agency (IRENA) in 2018, the capex of CSP projects has declined by over 35% from 2013 levels. 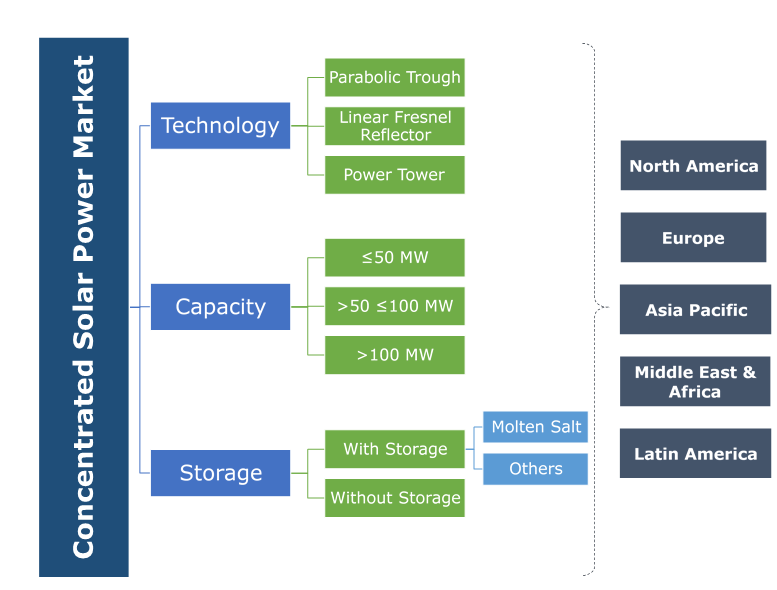 Shifting trends of project location toward Middle East and Asia Pacific region along with advancing thermal energy storage technology will further stimulate the business growth. Power tower CSP industry will gain momentum on account of ongoing investments toward development of renewable energy favored by government incentives & fund allocation. Moreover, ability to achieve higher operating temperatures, improved efficiency, and enhanced capacity utilization through the utilization of dual axis solar tracking heliostats, will boost the technological adoption. Relatively lower specific cost along with minimal technology development risk are the primary factors that will drive the parabolic trough CSP industry growth. As of 2018, the technology has witnessed highest cumulative installed capacity across the global industry. However, maturity of the technology implies to limited potential for further cost reduction, therefore resisting the product deployment in coming years. Linear Fresnel CSP market in 2018, was valued over USD 50 million. The industry growth is primarily attributed to simple design and use of cheaper flat glass mirrors associated with the technology. Furthermore, these systems require lesser amount of steel and concrete support structure, implying to simplified assembly process and reduced installation cost. However, the technology may witness subdued growth owing to its longitudinal & transversal cosine optical losses and lower operating temperature implying to lower operating efficiency. >100 MW CSP market will witness growth on account of its lower specific cost driven by economies of scale. According to IRENA, specific cost of a parabolic trough CSP plant can be reduced by approximately 12% by expanding the plant size from 50 MW to 100 MW. Further, larger size implies to higher reflective surface area, therefore resulting in higher operating temperature, leading to better capacity utilization by enhancing the thermodynamic efficiency of the plant. ≤50 MW CSP market is anticipated to grow on account of increasing participation of regional players favored by incentives and supportive regulations by respective governments. Moreover, the ability of these systems to complement industrial process heat systems, including coal and oil-fired boilers as a measure toward reduction of fossil fuel consumption will positively influence the industry growth. 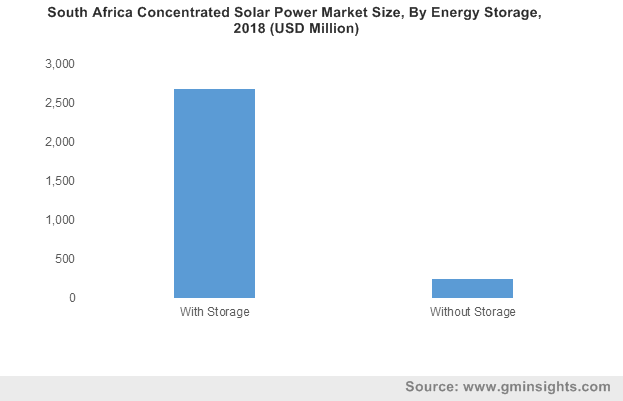 Growing need for cost effective energy storage technology driven by increasing penetration of renewables in the energy mix will augment the CSP with storage market share. Higher capacity utilization factor (CUF), lower LCOE and higher overall plant efficiency are the primary factors that will further boost the industry growth. As per a leading publication, integrating a CSP plant with 12 hours of thermal storage can reduce its LCOE by nearly 20%. CSP without storage market is anticipated to grow on account of ongoing efforts to achieve renewable energy target by respective governments coupled with relatively lower capital expenditure. As analyzed by IRENA, adding four to eight hours of thermal storage can lead to a surge in capex by over 35%. However, the recent industry trends implicate the divestiture by investors owing to certain technological drawbacks including lower reliability and reduced capacity utilization. Asia Pacific market in 2018, was valued over USD 1.5 billion. Lower manufacturing cost of components, economical human resource and high solar irradiance levels are the key factors that will boost the industry growth. High carbon emission reduction targets by countries including China and India in line with rising demand for electricity will further stimulate the market growth. Ongoing sizable investments toward sustainable development, along with shifting focus of investors toward green energy alternatives will favor the Middle East market size. For instance, in 2017, UAE invested over USD 2 billion toward the integration of renewable energy, witnessing a growth of over 2,500% from previous year. Significant number of clear days and high solar irradiance along with depleting fossil fuel reserves will further complement the business outlook. Key players operating in the concentrated solar power market include Abengoa Solar, Acciona, GE Renewable Energy, TSK Flagsol, Enel Green Power, Suntrace, BrightSource, CSP Services, Atlantica Yield, Shams Power, SolarReserve, ACWA, Therminol and Chiyoda Corporation amongst others. Concentrated Solar Power (CSP) technology utilizes the thermal energy associated with direct solar radiation by concentrating the sunlight spread over a large area to a single point with the help of an array of parabolic mirrors in different configurations. The concentrated radiation is directed to the receiver integrated with heat exchangers, which transfers the received heat to transfer fluid, which is then used to generate steam to run the turbines. Historical data coverage: 2014 to 2016; Growth Projections: 2017 to 2025.